You don’t want to add cleaning up a property to your long list of things to do when you buy a new property. Ideally, the property would be ready for you to move in and set up shop without any extra work – or ready for your tenants. You don’t want to have to get rid of furniture, old equipment, construction debris, or other debris left behind, and you don’t want to have to scrub floors and walls. Yet this is exactly what you might have to do. When people lose their homes to foreclosure, they often leave in a hurry. Though they may have known for months that the property was moving toward foreclosure, they may have been in denial or may have thought they could refuse to leave. So, many people end up being forced to leave when they have not packed or prepared. They may take what they can throw into a suitcase, and the rest is left behind for the new owner to deal with. If you have recently purchased a foreclosed property to rent out or to flip, you may be left with the unfortunate task of getting rid of a lot of furniture and personal items from the previous owners. Instead of spending a few days or weeks dealing with that work, you can call a junk removal specialist to deal with it in just a day or two. You may have decided that you need to downsize your operations to maintain or improve your profitability. Or you may have just decided that you need to move to another location that better suits your needs, either with the space or the amenities offered. When you move, there may be a lot of junk that you don’t want to take with you, yet you don’t want to deal with packing, moving, and disposing of it all properly either. You can hire Palmer Township junk specialists to gather up everything and deal with it all for you. You will simplify your move and save yourself a lot of time and hassle. Just like with owners evicted by foreclosure, renters who move out can leave behind a lot of junk. They don’t want to deal with it or pay to have it moved, so they leave it for you, the landlord. Some of it might be useful, like furniture, and some of it might be out-and-out trash, littered all over the house or apartment. Junk removal specialists can sweep the entire property for anything that is not supposed to be there, whether it be furniture, heavy equipment, or trash. They will take it all to the dump or an appropriate donation site. You may not be moving, but you may be ready to update some old equipment. You want to get all new copiers for your office space, or you put in new refrigerators and stoves for your restaurant. Maybe you put in new heavy equipment for your production facility. A junk removal specialist near NJ will come in and take out all the old stuff and dispose of it appropriately. Or perhaps you have decided to remodel or update the physical space, such as adding more square footage, making over the offices, or putting in items that will improve efficiency. You are bound to end up with a lot of construction waste. Junk removal specialists can get rid of all that for you while also ensuring that you comply with disposal regulations. 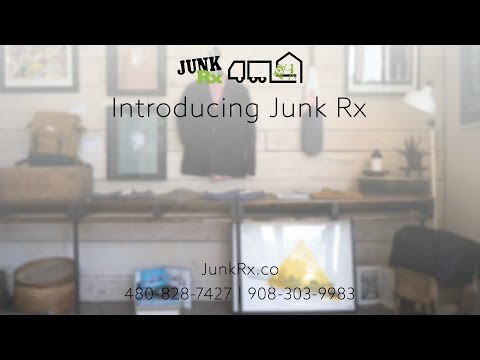 Whatever the reason that you need a commercial property cleanout, the junk removal specialists at Junk Rx in Washington, NJ can help you. We handle all sizes of jobs, from basic trash cleanup after a renter moves out to major equipment and construction waste removal after an upgrade or remodel. No matter the size of your property or the reason for your clean out, we have the tools, the equipment, and the skills to handle your junk removal safely. Call us in New Jersey to get a free estimate today.